Join us on the Saturday morning before Easter as we celebrate Easter with continuous Easter egg hunts, petting zoo, bunny face painting, train rides, bouncy houses, swing ride and the Easter Bunny. The events are open to little ones up through 4th grade. Please note that the egg hunt can be done at any time during the event. Join us on Maundy Thursday (12noon and 7pm) and Good Friday (12noon and 7pm) for holy week. 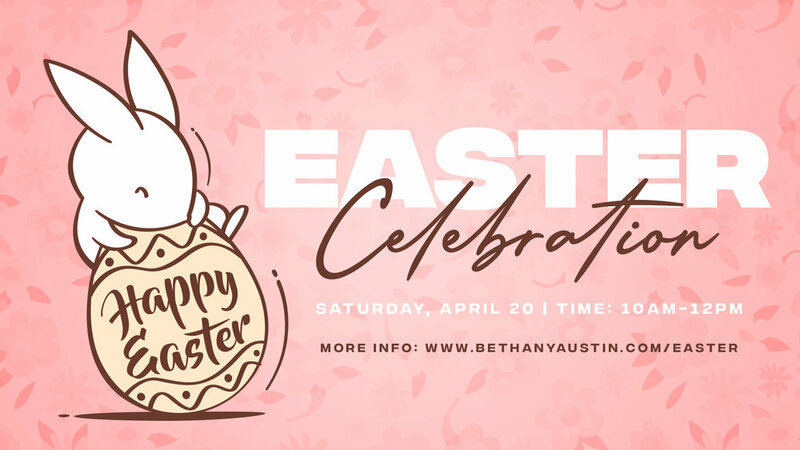 Help us make this a success event as we invite the community to Bethany for the Annual Easter Celebration. We have much to do for this event – set up/clean up, Easter egg hunt hiders, painting bunnies on faces, answering questions, and much more. We begin with Palm Sunday and continue the week with Maundy Thursday on April 18 at 12Noon and 7:00pm in the Sanctuary and Good Friday on April 19 at 12Noon and 7:00pm in the Sanctuary. We will celebrate on Sunday with Jesus’ resurrection.